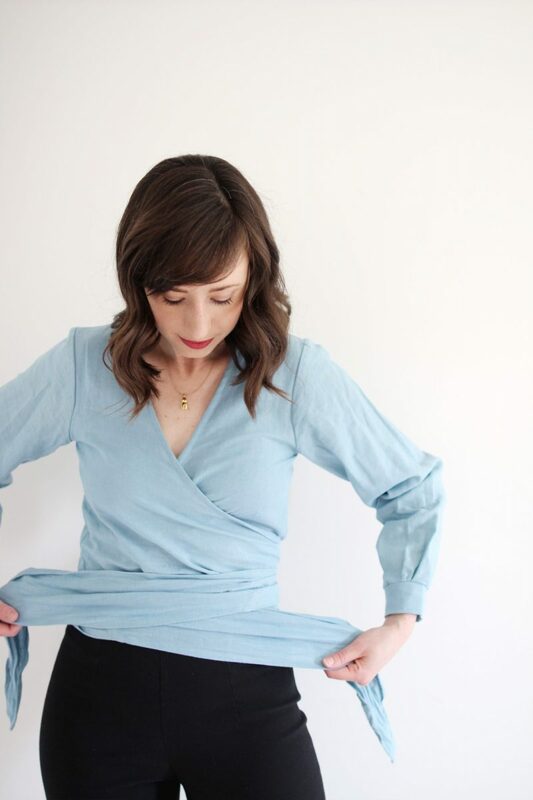 Today I’m excited to be sharing a recent addition to my closet, the Thea Wrap Top from EMLEE, a Nashville-based line of thoughtfully produced clothing. 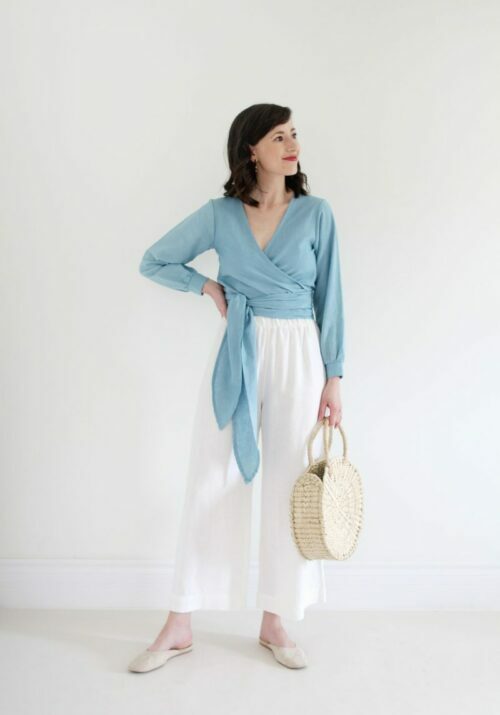 I’m so pleased to be working with Emily Herron, EMLEE founder and designer, and to be able to introduce you to her beautiful work. 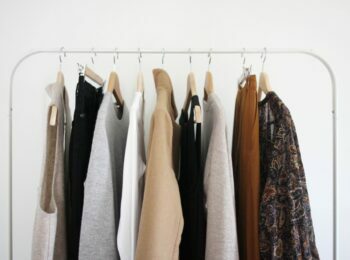 As I mentioned in this post, I’ve been eager to add some fresh colour to my closet and to step outside of my usual comfort zone. 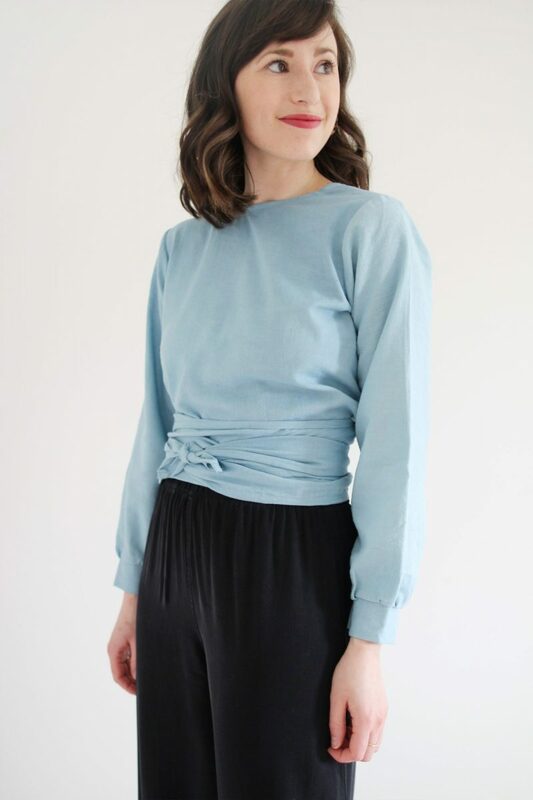 I’d admired the Thea Wrap Top since last fall and once I saw it was being released in this gorgeous sky blue I could resist no more. I’m so glad I took a risk and tried this piece because it’s already opened up a ton of new potential in my closet! I’ll start today’s post with a closer look at the fabric, fit and some other quick facts about this top. 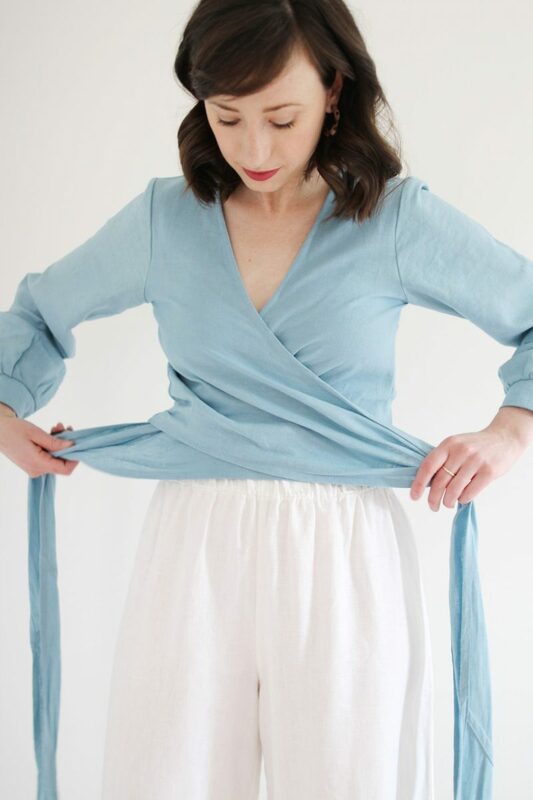 Then I’ll share the 4 looks I created for Spring, Work, Summer and Fall, each with a simple three step how-to for tying the Thea Wrap Top. Let’s get started! 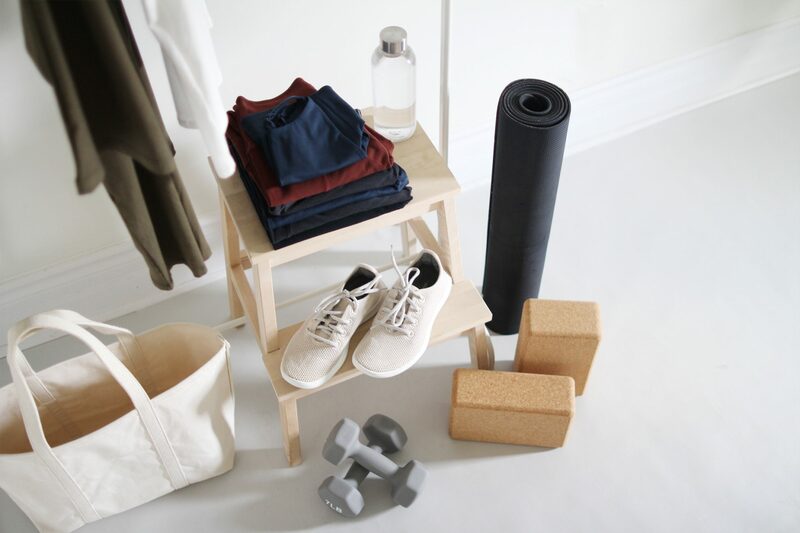 *This post was produced in partnership with EMLEE and Style Bee earns a commission on sales made using the reader code (at no additional cost to customers). Valid through April 30th. More details below. 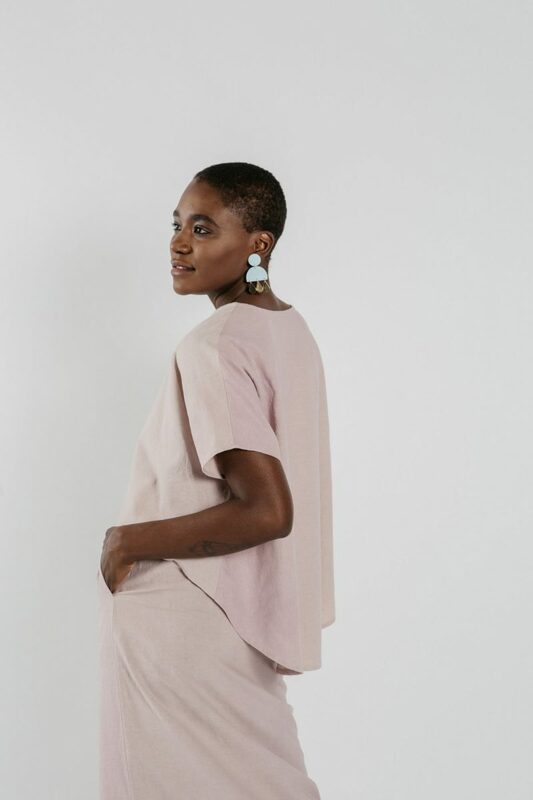 ABOUT THE BRAND: From EMLEE’s beginnings in 2013, designer Emily Herron has sought out to produce thoughtfully designed apparel for intentional women, featuring multi-functional garments made from eco-friendly, natural fabrics. 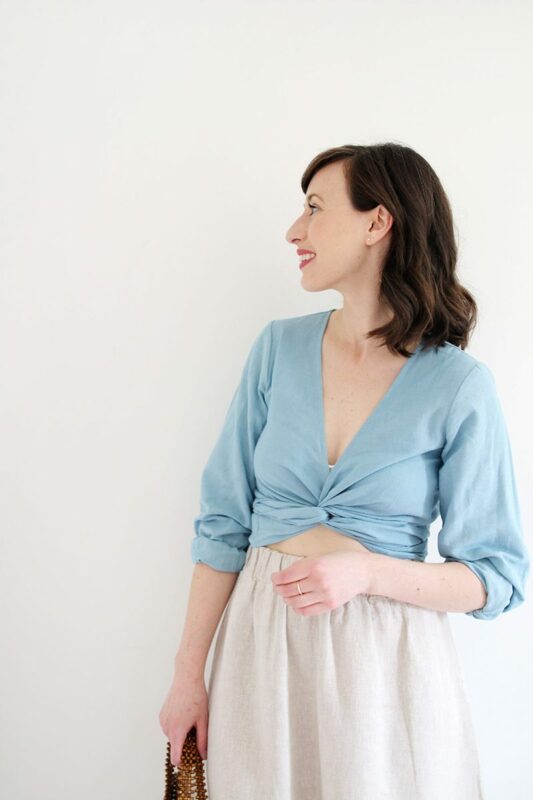 Taking inspiration from the real women in her life, including her grandmother who first taught her to sew, as well as her own experiences as a new mother, Emily seeks to create durable clothing women will feel beautiful in at all stages of life. PRICE: $168 USD $142.80 USD with ‘STYLEBEE15’ through April 30th. 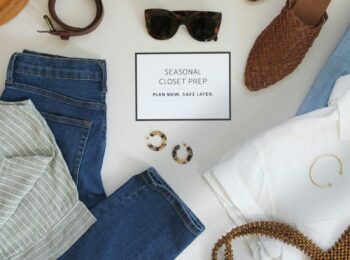 THOUGHTFULLY: Designed, sewn, packaged and shipped from Nashville TN. Made-to-order with a 2-4 week lead time. 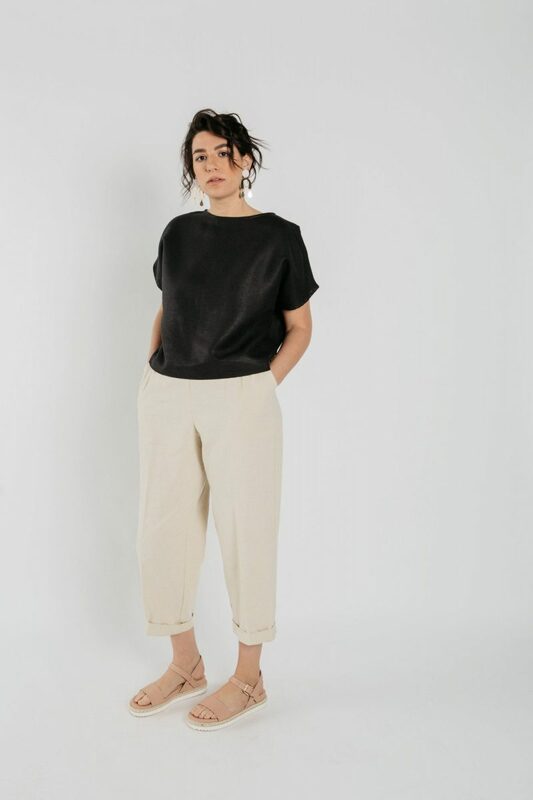 FABRIC: A unique blend of 55% hemp and 45% organic cotton feels like a dream to wear. 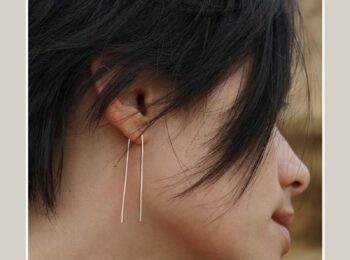 It’s so soft, breathable and comfortable with an easy-going texture that has a touch similar to that of raw silk. It’s low maintenance but elegant at the same time making it highly versatile. 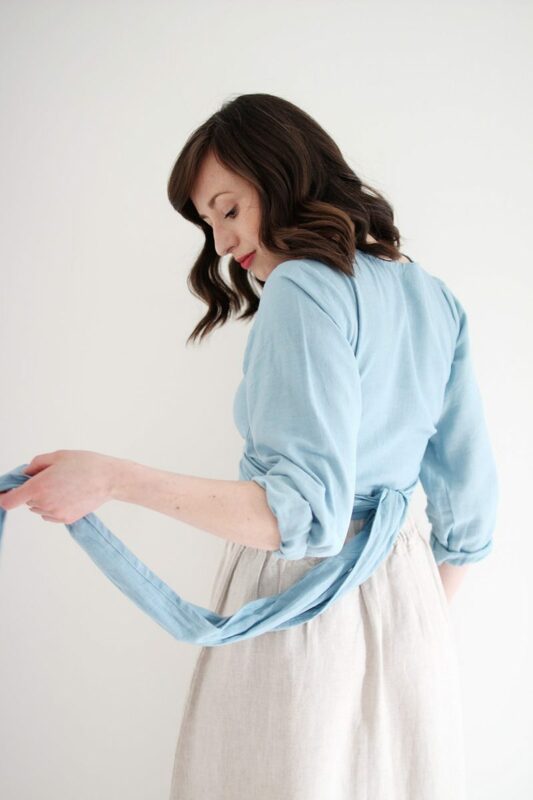 It will crease if folded but it’s not terribly wrinkle prone like linen or silk and if hung between wears most creases will fall out on their own. It’s also almost fully opaque and in these photos I’m wearing a cotton cream bralette. CARE: Machine wash cold, hang dry, steam iron. COLOUR: This gorgeous Sky Blue is custom dyed in small batches, making each one unique and special. It’s a slightly muted cool hue that compliments any skin tone. ALSO AVAILABLE IN: Ivory and a sleeveless version in Sky, Blush or Ivory. 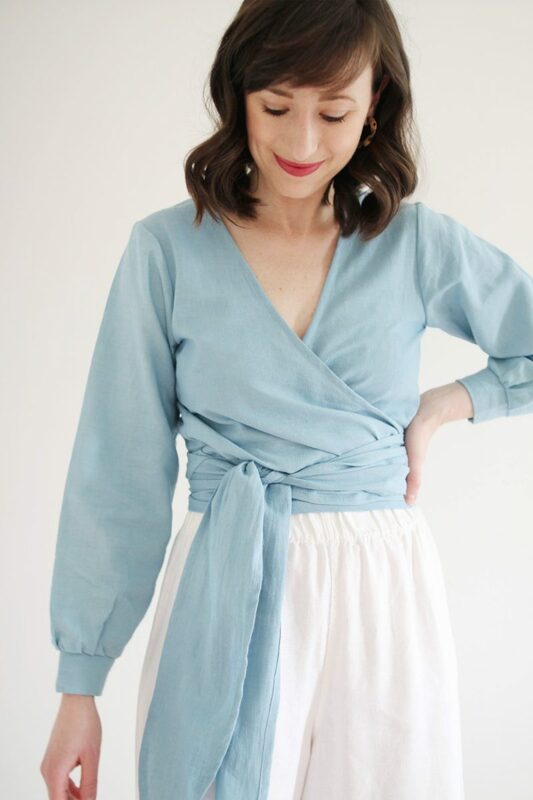 I opted for sleeves to give this piece a longer seasonal life in my closet but the sleeveless version is great for warmer climates. FIT: Overall I’d say this piece runs true to size. The shoulders are seamed and structured so they fit more like a typical shirt, which makes it easy to layer under blazers and other jackets. 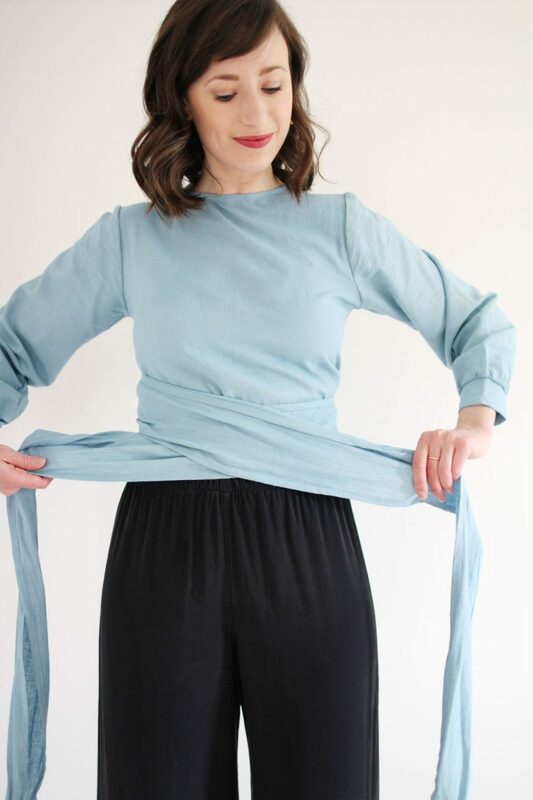 The wrap style makes the fit fairly flexible through the torso and waist. I am a 32C and would consider sizing up if you have a more ample bust size or a broader shoulder since the fabric doesn’t stretch. DETAILS: I love the long tapered ties and the slim cuffs that create a puff sleeve. 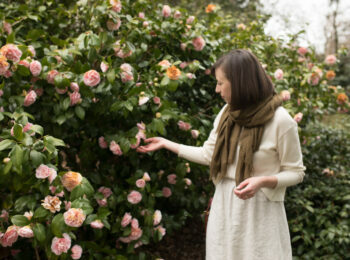 The reversible neckline is carefully designed and wears well either way. It’s also bra-friendly whether you’re wearing it wrapped with the v-neck to the front or back. Little extras like a tortoise button on the cuff are thoughtful and elegant. 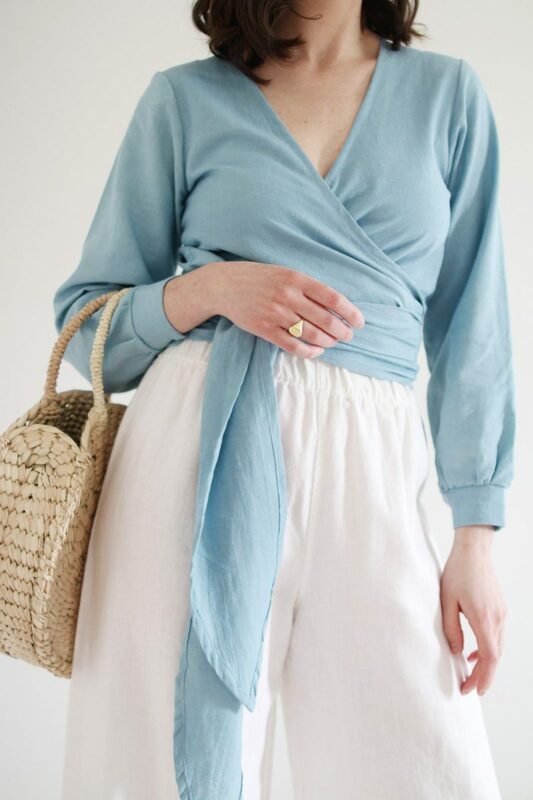 As soon as I started day dreaming about wearing this top I found myself imagining it with my ivory linen Florence pants. Luckily, in reality it worked as well as I’d hoped! 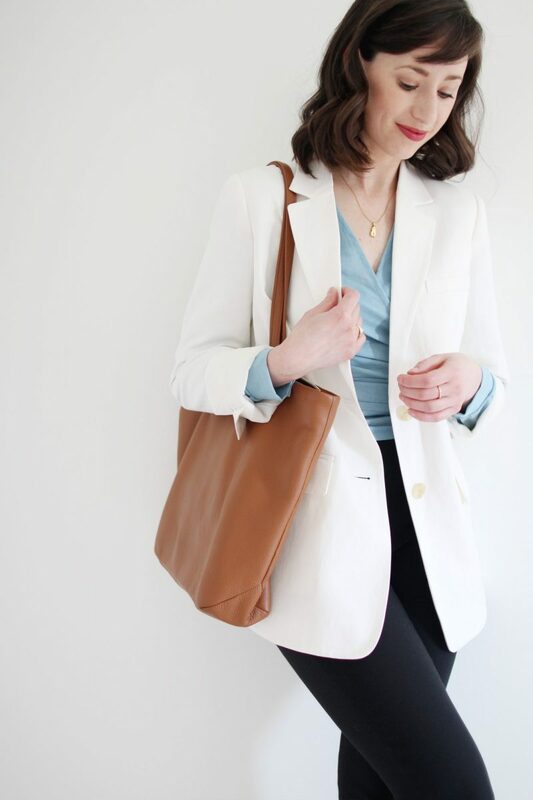 I wanted to keep the palette light and airy so I slid into a pair of neutral suede flats and picked up my woven circular tote. A pair of subtle statement hoops felt like the right addition with a gold signet ring to polish off the look. 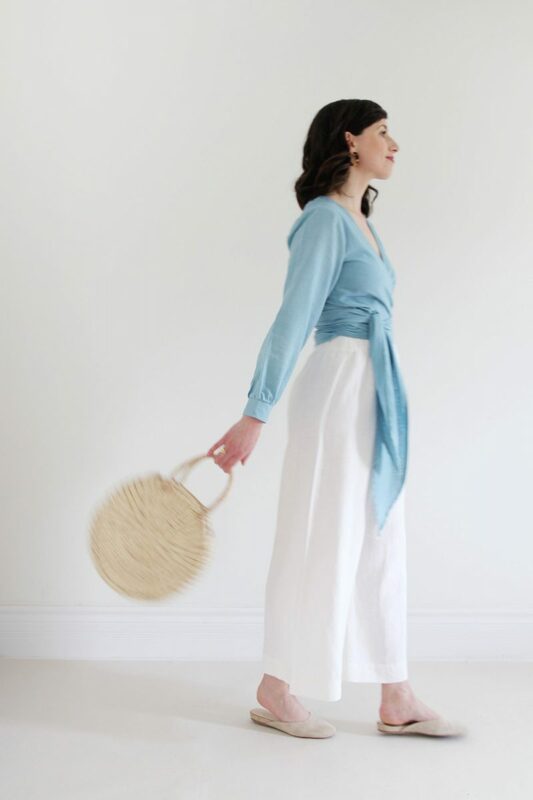 I love the freshness of the ivory and blue together and the softness of neutral accessories in natural materials. 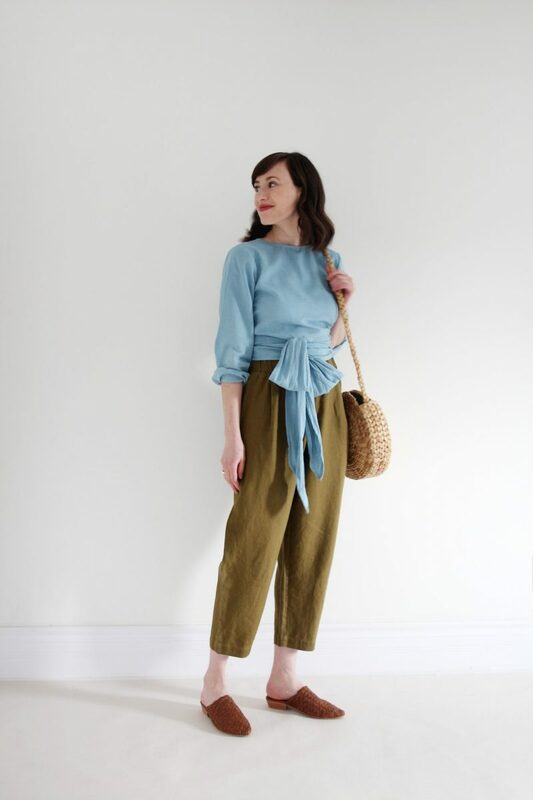 This outfit came together in a way that’s elegant while still being completely comfortable and practical for lots of possible activities. 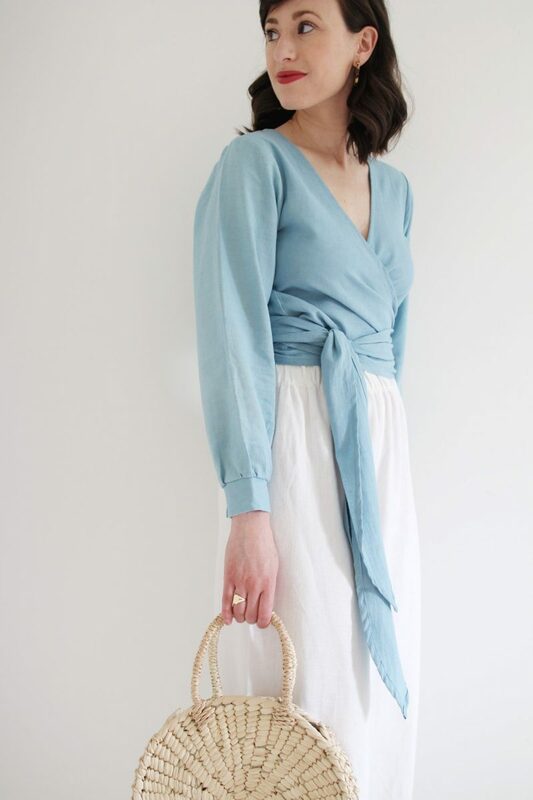 I think this one would be perfect for family get-togethers, baby showers, birthdays, dinners downtown and just about any occasion that calls for a bit of a bit of fanciful fun! 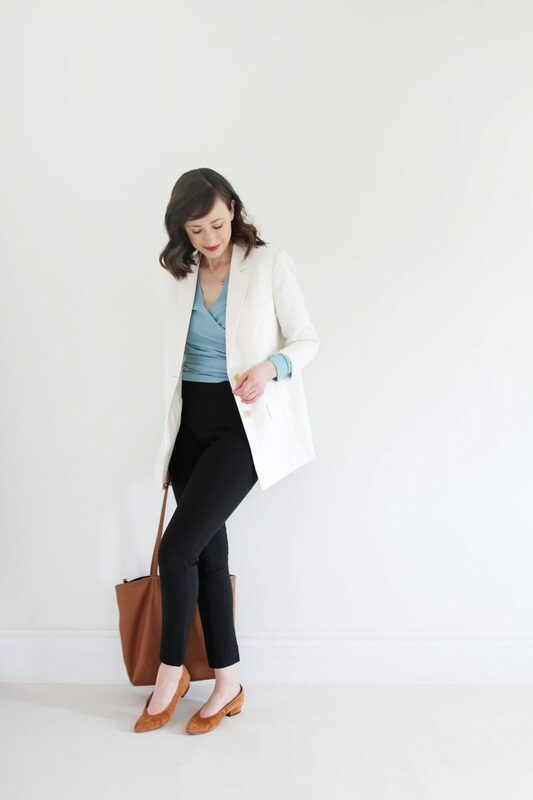 While I don’t find myself in corporate settings much these days I still need to put together professional outfits for design meetings and often receive requests for more work appropriate looks from readers too. 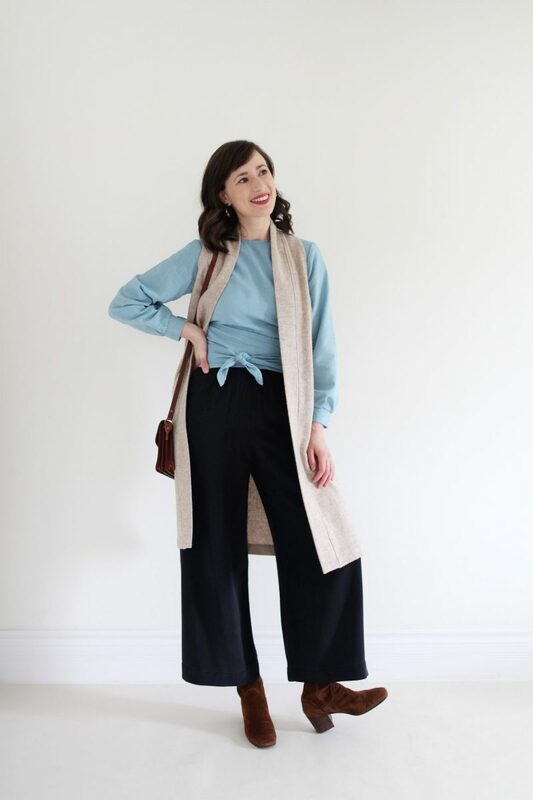 Ergo, this outfit, which is my take on how to style the Thea top for the office. 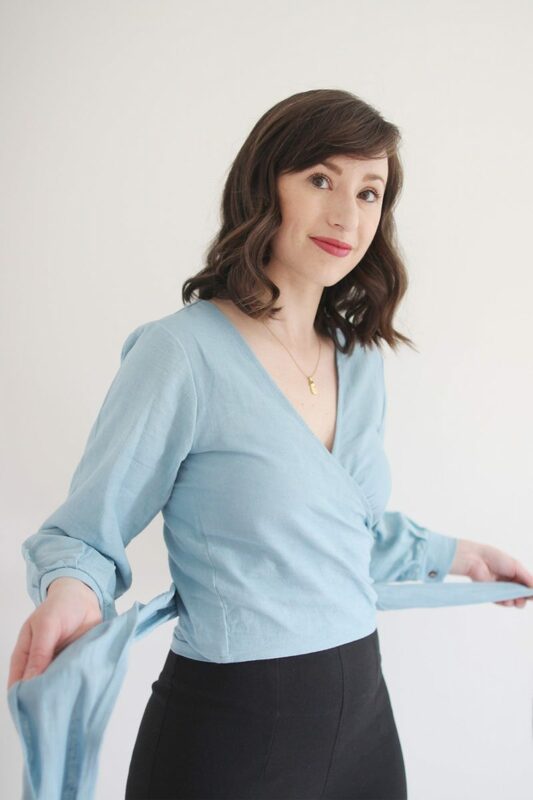 I wrapped the long ties around my torso a couple of times and positioned them lower on my waist, over the top of my black pants for a little more length. 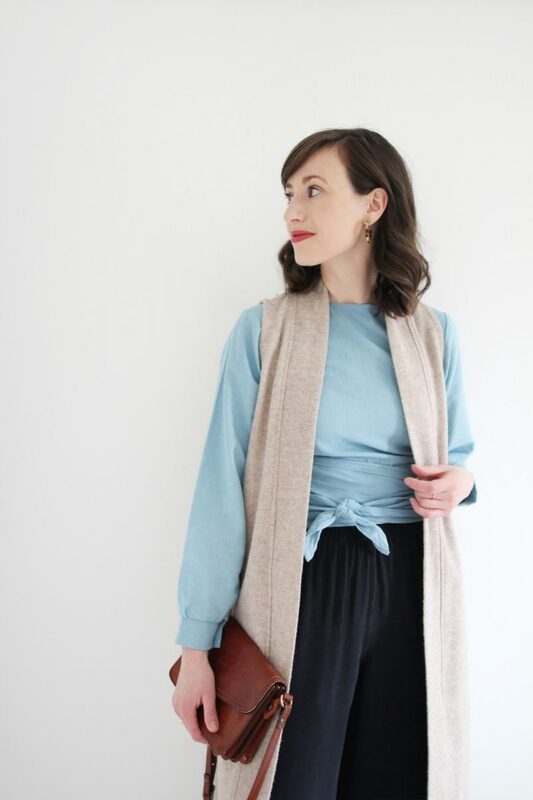 Then I added a slightly oversize blazer with the sleeves rolled to let the blue cuffs of the top peek out (a personal favourite styling trick). 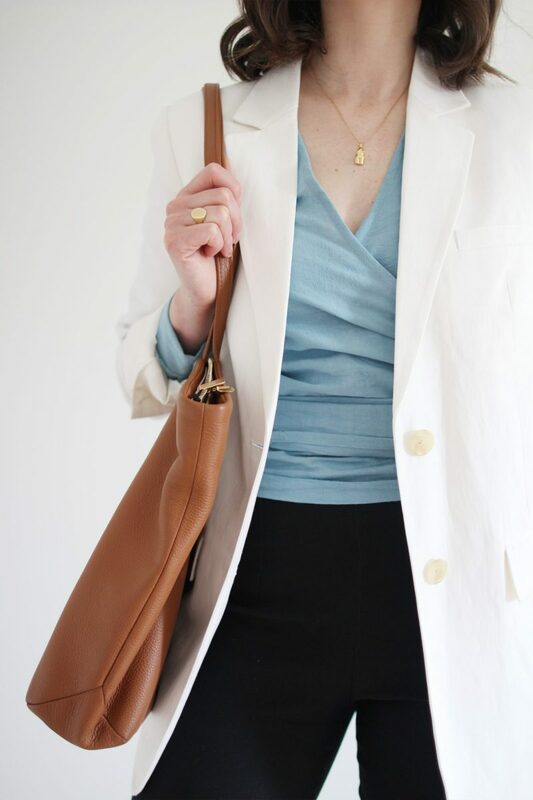 I like how caramel brown compliments this muted blue so I grabbed my go-to work tote and suede pumps. 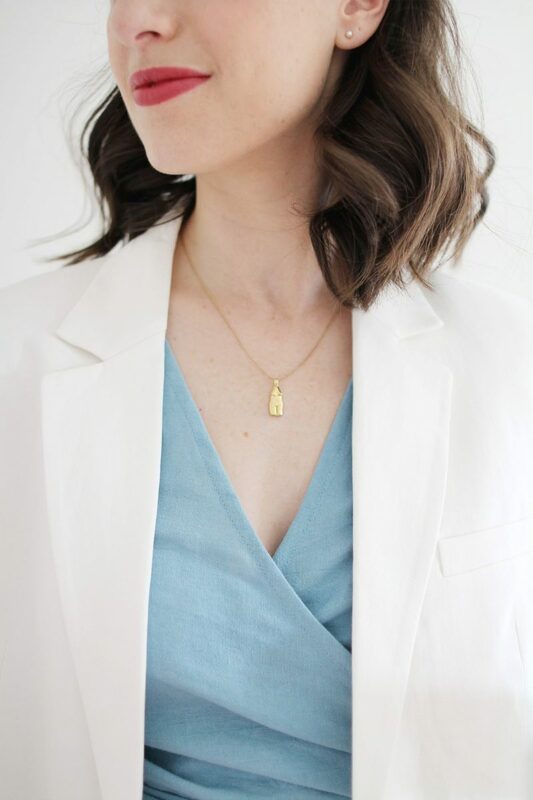 A simple pearl stud picks up the ivory from the blazer and a small gold pendent is an easy finishing touch. I might not have given this styling trick a go if it weren’t for Emily’s great styling tutorials on the EMLEE IG Stories. 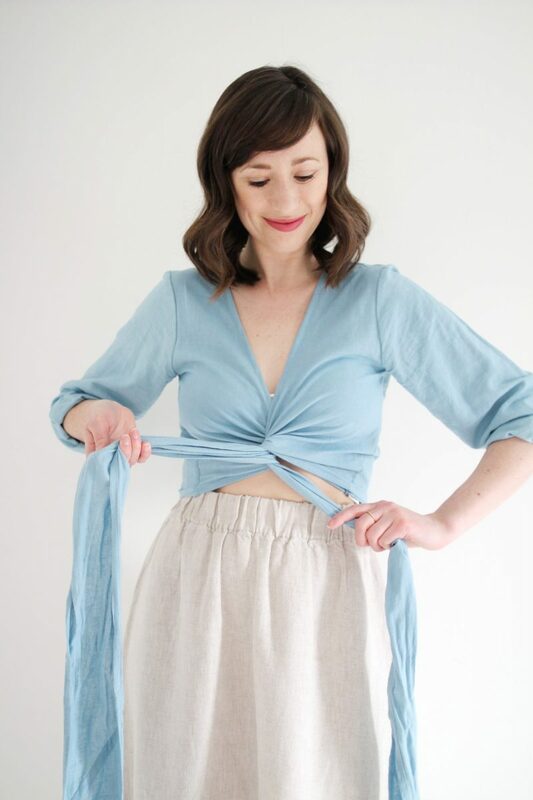 I was inspired by how a twist in the front made this top instantly summer ready. Letting the ties fall long at the back adds a bit of drama too. It’s perfect for a beach vacay, European adventure or a sunny backyard shindig! I’m not usually one to bare much skin so when I wear a crop top I like to balance it out with plenty of coverage elsewhere. In this case the long sleeves on the top and a midi length skirt pair nicely with a more revealing neckline and waist. 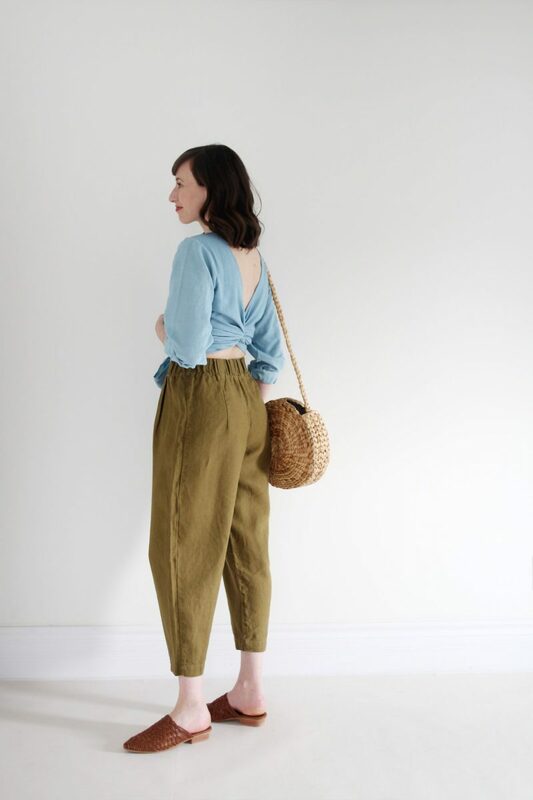 I buckled up my favourite clogs and grabbed a beaded bag to bring in some natural texture. I’m drawn to how feminine and playful this one is, in a way that gives a gentle nod to vintage glamour! BEADED BAG | ABACÁ || BEL SKIRT | gifted ELIZABETH SUZANN || CLOGS | No.6 STORE || PEARL STUDS | gifted JEWELS & ACES | BRALETTE | PANSY CO.
You know me, I can’t help myself when it comes to styling pieces for different temperatures and weather. 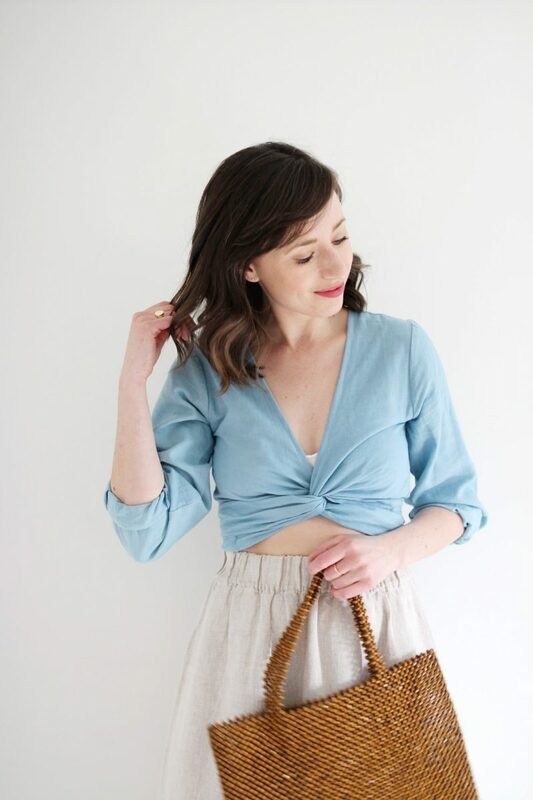 I rarely ever add an item that can’t transition across multiple seasons and this top is no exception. In fact, I think it’ll make for a great addition within my fall closet when the time comes (not rushing it though that’s for sure!). 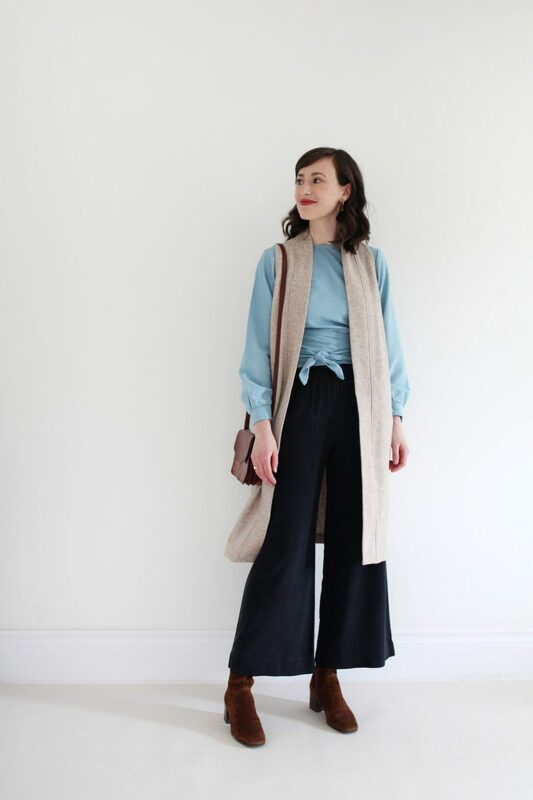 The challenge here was to see if this blue would work with some of my autumnal staples like my silk Florence pants, oatmeal wool duster vest and rich burgundy/brown boots and accessories. Turns out it fits in no problem! In fact, this might be one of the most interesting colour palettes I’ve created in a long time. To make this piece a little more fall-friendly, I opted to wear the higher neckline forward, with the v-neck to the back and wrapped the ties around twice to finish in a small knot on the front. 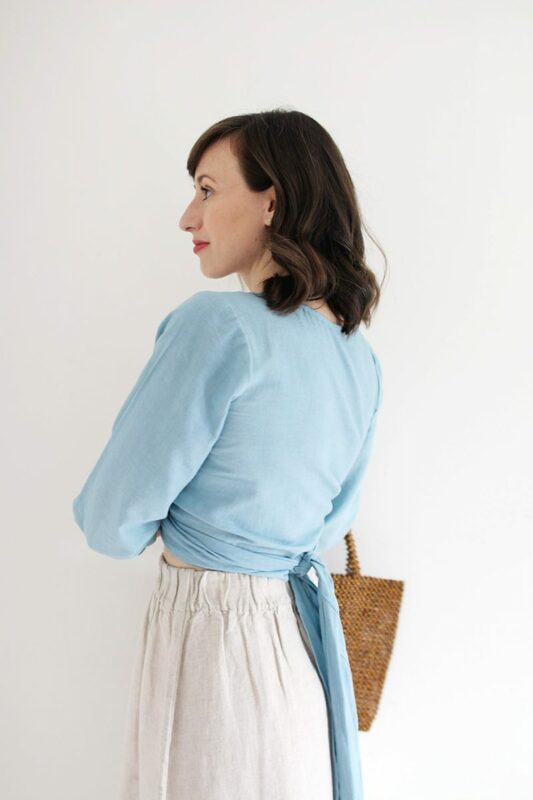 This is a chic way to wear the Thea and I like that the low back is a fun surprise when I remove my vest or outer layer. Technically, this is the same styling as the office look, just reversed! My camera was running out of batteries but I had to snap a couple of quick shots of this colour combination. To my delight, I found that this sky blue works really well with my olive green Andy trousers. Building on that combo, I felt it would pair nicely with the textures and brown tones in my Paris Mules and round cross-body bag. 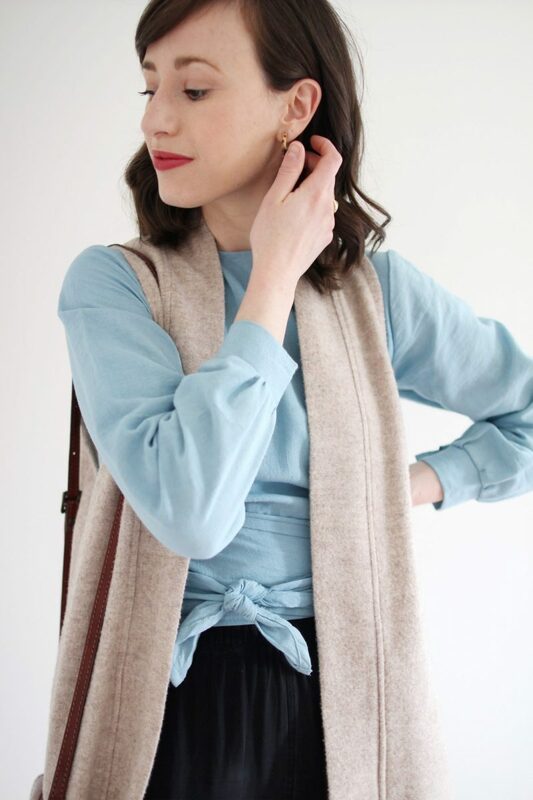 I rarely wear this much colour at once but it’s so fun to see how a little nudge outside my comfort zone, like adding something blue, can lead to feeling braver about lots of other style ideas! 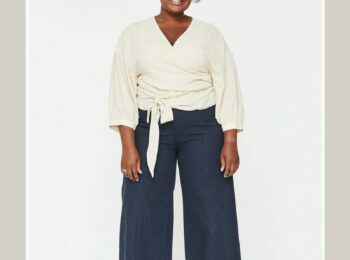 To style the Thea top for this look I used the cross and twist trick from my summer look but wore it to the back and then tied the long strips into a big bow on the front. 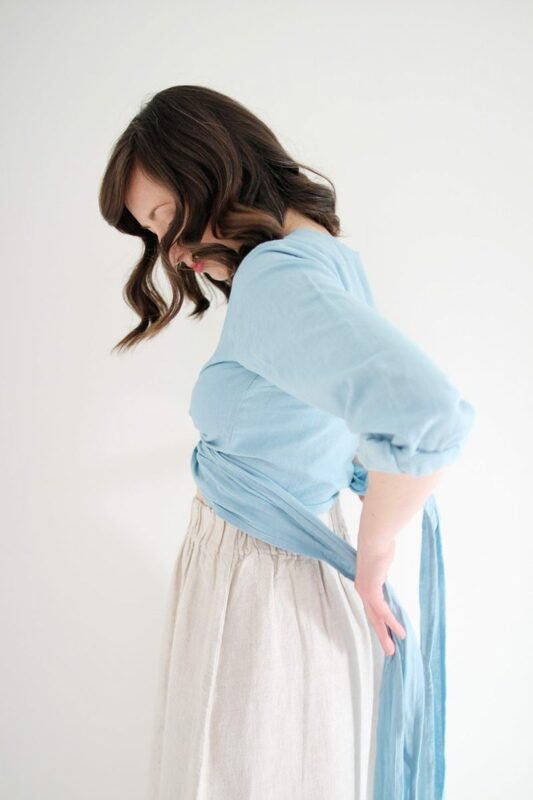 With the sleeves pushed up it feels a bit less girlie and more playful. How fun! 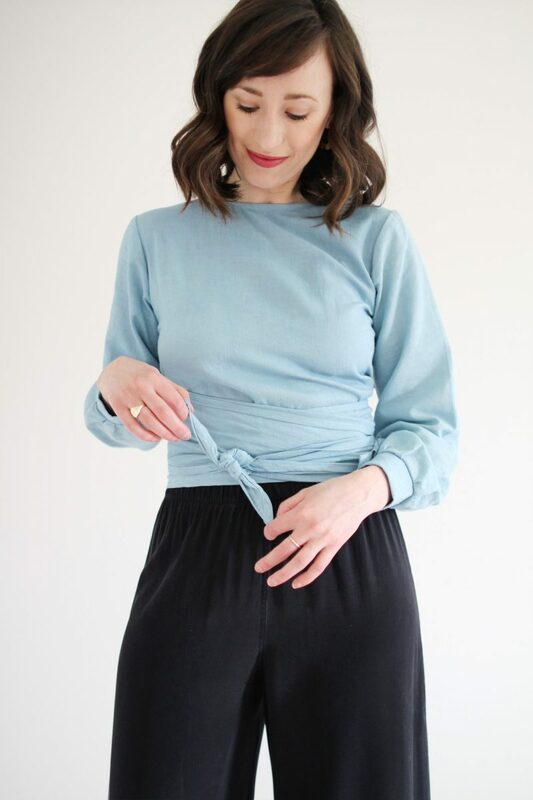 I HOPE YOU ENJOYED THIS STYLING POST FEATURING THE THEA WRAP TOP! THANKS TO EMILY FOR THIS PARTNERSHIP OPPORTUNITY AND THE GENEROUS READER TREAT! BE SURE TO CHECK OUT MY IG STORIES FOR A LOOK AT ALL THESE OUTFITS AND TYING TUTORIALS IN ACTION! Do you have a favourite look out of all these? How are you pushing your style boundaries this spring? This post is produced in partnership with EMLEE and contains affiliate links. 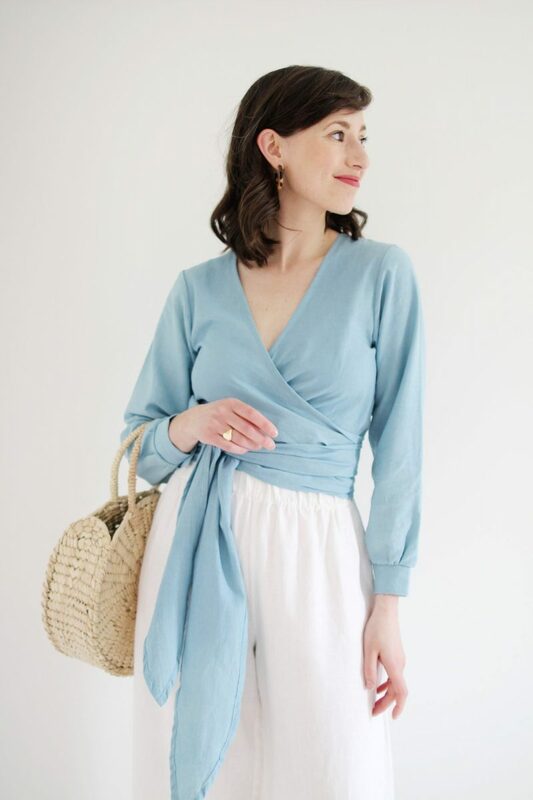 The Thea Wrap Top was gifted in exchange for this coverage and Style Bee earns a commission on sales made using the reader discount code (at no additional cost to customers) through April 30th. 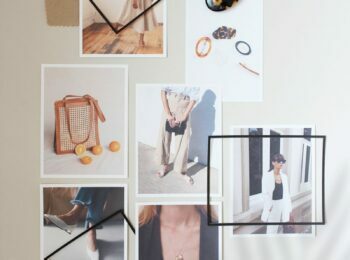 Thanks for supporting the independent brands that support Style Bee! 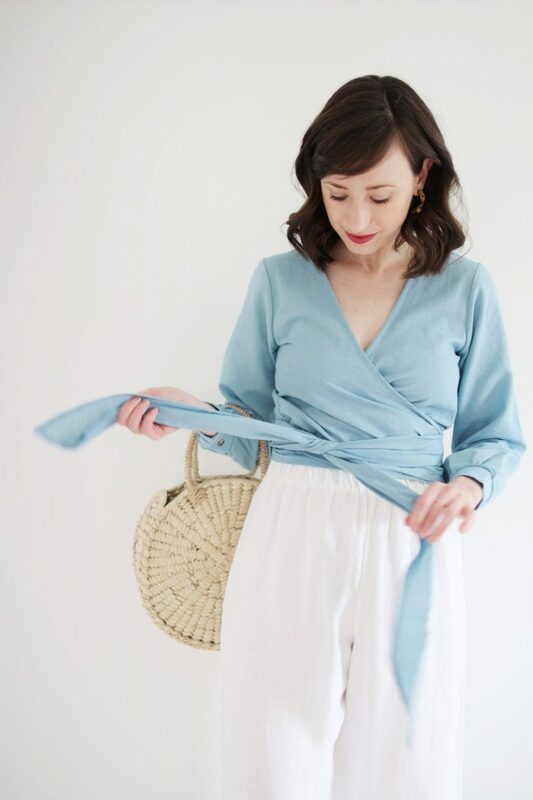 What length do you wear in the Florence linen pants? I am also 5’7”, and I don’t see any information about the inseam measurements of the regular and long on the ES website. Thanks! Love all of these looks. Wow, this top is so gorgeous! The tank version is just what I’ve been looking for for my own closet. Thank you for introducing me to another great designer! I love how you styled this beautiful top. 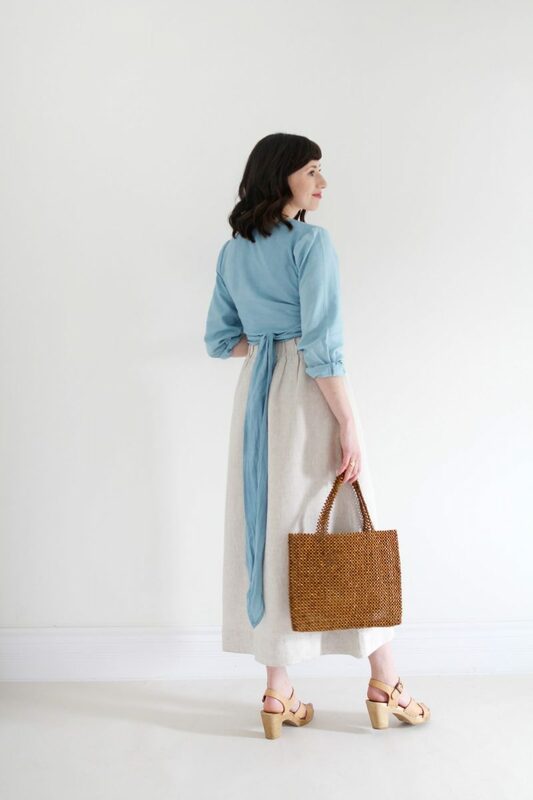 Each look is fun and different, which really speaks to the versatility of the garment! Love this top! Love this post! Your enthusiasm made my day Froya! 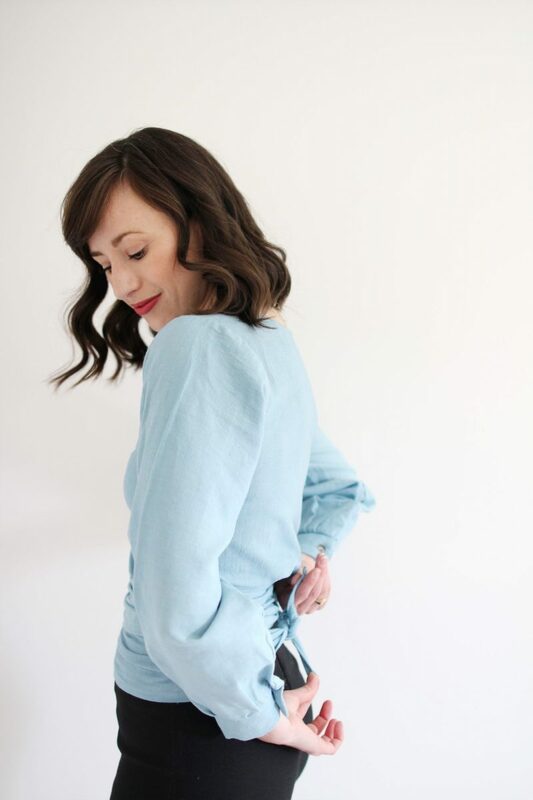 Emily’s eye for design and fabric choices are so smart and unique. I’m glad you see that too! If you go for a Thea I think you’ll really enjoy wearing it 🙂 Thanks for checking out the post! That top is so beautiful and so versatile! 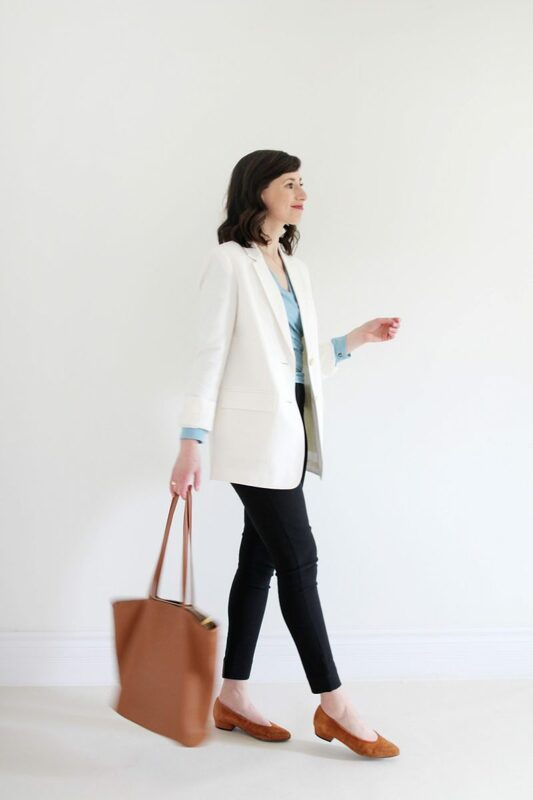 I love the office look you’ve created – it would work perfectly for my job! 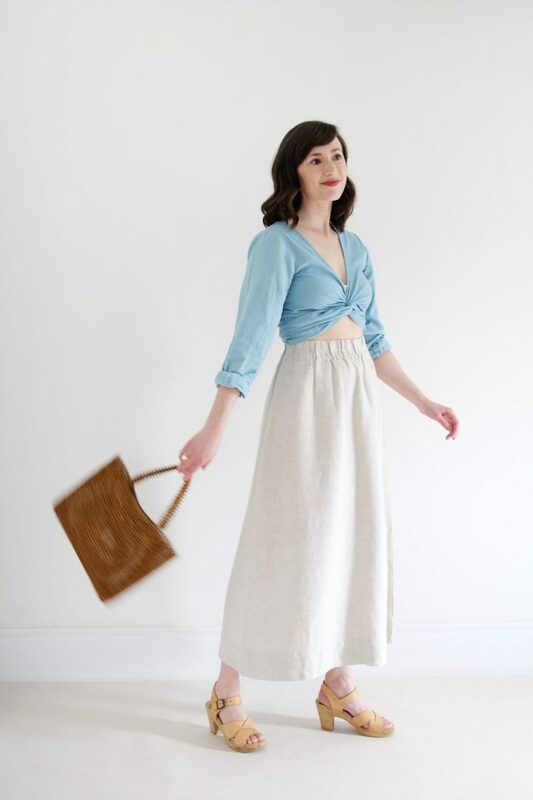 Hi, what size are you wearing in the Bel skirt? And what are your measurements and height? Thanks! Wow, what a wonderful piece! I love the many ways you’ve styled it. Thanks for another fun post.